Are you a thrifty jeweler? I sure am! I love a great bargain, and free is even better. This next article will share a number of ways you can be a thrifty jeweler too. Todays topic, my friend, is cheap beads.. Jewelry makers and hobbyists love beads. Without beads, designs just can't be put to the test or created. Of course, while we can draw pictures on paper, or come up with hopeful dreams in our heads, beads are a must for all jewelry makers. While money may be tight at times, there are ways to purchase cheap beads even if money is tight. There are even ways to make your own beads too. If your wallet has a hole, or the well is running dry in your home, read on to find out some easy ways to save money to keep up with your growing bead collection. Are there magazines in your home or colorful pieces of paper? If you own a bottle of glue, a bottle of some type of clear gloss, or even clear finger nail polish, you can create your own set of paper beads. Recycle your old magazines by finding color patterns in some of your old magazines. Tear out pages and measure out small long triangle like strips of paper. Cut them out and roll each strip onto a toothpick. Glue the point of the strip to the other point of the bead and let it dry. Clear coat it with some gloss or clear finger nail polish, and you can have your own set of paper beads. There are plenty of ideas for making paper beads all over the Internet. By searching for "how to make paper beads" on Internet search engines such as Google, you can create paper beads. You can also make your own cheap beads with fimo or baking clay. Form the clay into the shape of bead you want, create a hole with a toothpick, bake it, and then paint it the colors of your choice. There are many ways to create your own beads without breaking the budget, or hardly spending a penny. With supplies around the home, you can be as creative as you want. A great place to find old beads and findings is antique and thrift shops. 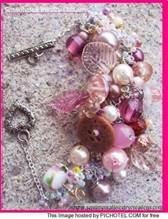 Look for old jewelry that can be taken apart easily. Most of these stores have old pearl jewelry, jewelry with unique and unusual glass beads, and perhaps styles that haven't been seen anywhere else. Bring in the old, to create new designs that may have not even been thought of. By using old jewelry, your jewelry pieces can have a little piece of history to tell a story. While looking for old pieces of jewelry, check out the buttons in the store if they sell them. Old buttons can make great centerpieces in any jewelry design. If you have buttons in your home, see what kinds of creations you can make using them. Visit your local sewing store, and buy unusual beads to make your designs. Buttons are also great to use for charm bracelets too or even a unique pair of earrings. If you are a sucker for online purchases, you can still save money by shopping for wholesale bead lots on websites such as Ebay or Artbeads. Log onto Ebay, and type in "wholesale beads," or "beads" to see what kinds of deals you can find. Sometimes you can buy larger collections in bulk and save money where you may spend more just purchasing a couple of designer named beads. Artbeads offers free first class shipping in the United States. Their Swarovski crystals are affordable, and can be purchased for as little as 0.10 each. Just by searching for wholesale beads or discount beads online, its possible to come around to some great deals. Ebay and Artbeads just happen to be a couple of the best places online to buy. So if your cash is low and the economy has been taking its toll on your household budget, it is still possible to enjoy your hobby without spending much money. Use your imagination, and look beyond the items that may be available in your home to create your designs. By using unique and odd items, you might just come up with one of the best designs to be sold on the market yet. For even more great ways to be a thrifty jeweler, subscribe to my "I'm Making Jewelry in my Jam jams" newsletter. Next to making jewelry, my next favorite thing is saving money. Subscribe now and receive a free tutorial too!